There’s so much potential in ecommerce right now, but with a virtually endless supply of products you could sell and needs you could meet, one big challenge is figuring out exactly what to sell online. For some, a particular product idea will strike immediately, but for many of us looking to start businesses, the sheer number of possibilities can lead to choice paralysis. Consider that Amazon, the largest ecommerce retailer, listed over 562 million products in January last year. That’s more than half a billion different products people are buying online. Which one is the right choice for you? Don’t worry. Today we’ll explore a few strategies to find just the right ecommerce products for your current or future store. To begin with, let’s look at a few methods you can use to find product ideas. When collecting product ideas, the main thing you want to do is watch for a “point of difference.” This is something we discussed on our podcast episode with multimillion-dollar ecommerce business owner, Gretta Rose van Riel. Without further ado, here are a few places to begin with for inspiration. Are you plagued by a problem in your life that doesn’t have any existing solutions on the market? When you sell a product that solves a need you have, you already have a “why” that drives you to build your business. You can also start with any interests that you’re eager to explore further. Let me share a couple of examples. Jon Oringer was a programmer with a casual interest in photography when he launched Shutterstock. It started as a side gig with 30,000 of his own photos. The stock photo service has since then become a phenomenon, worth over $2 billion. Pat Flynn, an entrepreneur, blogger, and podcaster, is scratching his own itch by launching Switchpod on Kickstarter, a tripod for Vloggers. However, you also need to watch out for some common mistakes while following the above advice. To begin with, validate that your product idea solves a larger problem for consumers. Also, don’t commit the mistakes that entrepreneurs make while scratching their own itch. N. Taylor Thompson, a member of the Forum for Growth and Innovation at Harvard Business School, touches upon them here. Many websites like Cool Material regularly curate and review products for their audiences. Suppose you want to sell products online targeting men. Here are the specific sections on their website that you could explore for finding the awesome goods they cover. What’s awesome about these websites is the niche product ideas you can find, which often turn profitable for an ecommerce business. For instance, I found an Anti-Theft Backpack while browsing the shop section at $120. It’s meant to give travelers peace of mind when abroad. There’s not much chance you’d stumble across such a unique product unless you were actively scanning consumer product review blogs like CM. 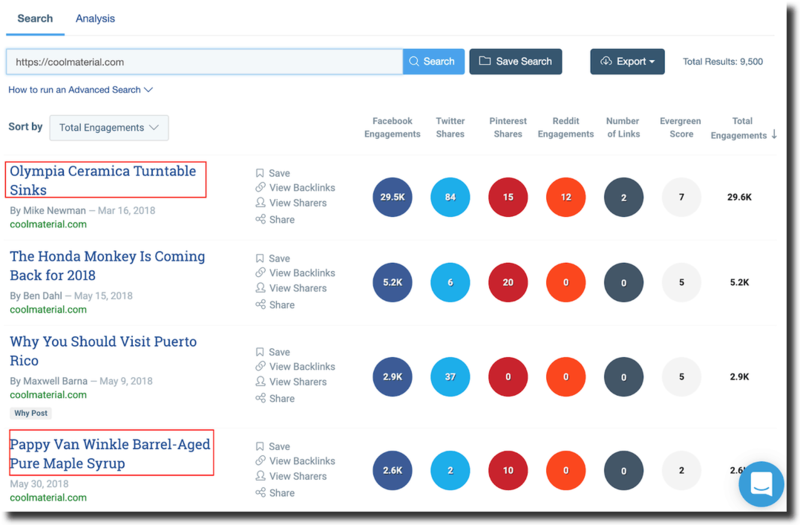 You could also plug the product review blog website inside Buzzsumo to find the posts that got the most social media love from consumers. In the screenshot below, I can already see two potential products. If you’re already aware of the niche you want to serve with your ecommerce store, it makes sense to find relevant communities online. Reddit is the self-proclaimed “front page of the internet.” It contains thousands of subreddits (niche communities) you could explore for product inspiration. What is One Product Under $20 That You Recommend Everyone To Buy? You can also explore Pinterest to find sub-niches for products and come up with private label product ideas. You’re already aware of the biggest online retailers, Amazon and eBay. Here are some product lists you could explore. Amazon best sellers list – Here you’ll find Amazon’s most popular products, updated every 24 hours. To jump to specific department bestsellers, use the left sidebar links. I would also recommend you explore the tabs at the top (as seen in the screenshot below) to discover lesser-known products. eBay Trending – This page gives you a list of products with the number of searches and product listing links. Use the Watch Count tool to find out the number of times people have “watched” a product. The products with the most watches are those that have generated the most interest (people are reviewing them with the potential intent to buy them). Here’s the number of watchers for the recent book by author and blogger Mark Manson. If you get interested in a specific product, read some customer reviews and keep an eye out for for constructive feedback that could suggest opportunity to provide competition. Once you’ve noted a few product ideas, it’s time to evaluate them. Let’s begin with the common characteristics of the most successful ecommerce products. Whether you intend to create a new product or sell an existing product, it should ideally have the following ingredients. Customers seek relief from problems in their lives. Indeed, we all buy solutions for our frustrations. We want to weed out the time suckers and poor experiences from our lives and we’re always on the lookout for something that can help. If your ecommerce product doesn’t solve a problem, then it’s going to be difficult to build a sustainable business around it. If there’s zero competition on the market, reconsider the product. It’s very unlikely that you will “create” demand for a product from scratch. On the other hand, hot-selling and popular products need a stellar differentiating branding strategy to cut through the noise. Shoot for the sweet spot between the extremes. Amazon has set the standard in the ecommerce industry for fast and free shipping. As a result, if the size of your product makes transportation expensive and inconvenient, you will likely struggle with shipping. The high delivery costs can also affect your conversions. While Amazon can work with products that have wafer-thin margins because of its scale, you don’t have the same degree of freedom. To build a strong foundation, ensure that you make a decent profit margin for every transaction. We’ll look at another metric to make sense of the product. Once you validate the above aspects in your product, it’s time to move on to the five following questions for evaluating the product’s market. To get a better sense on the demand for your product and viability of your business, try to answer the following five questions. 1. What kind of market is it and what is the market size? To future-proof your business, take a long-term view of the product you want to sell. Ideally, you want to get your hands on a stable and timeless product. Otherwise, ensure that it’s a product picking up on a trend. If the product’s only a fad (with short-time popularity), you also need to plan your exit strategically. For instance, the clean living lifestyle is a trend that’s gone mainstream in Britain. The rise of diet searches tells us that people are increasingly looking to consume natural and healthy products. If you build and sell an organic product that contributes to the trend, then you are on the path to a sustainable business. Next, approximate the size of your market. For help here, I’ll refer you to a great guide by Rob Go (co-founder of a seed-stage VC firm). 2. What does your customer look like? At this stage of product consideration, you don’t need to flesh out a detailed buyer persona. However, it helps to have a broad overview of who will buy from you. To get started, search for businesses selling similar products and try to find out some basic demographics of their customers (here are five free resources for audience research). 3. How much is your profit and what are the variable costs? For example, if the price of your product is $20 and the unit variable cost is $4, then the unit contribution margin is $16. Mark Patchett, the founder of The Ecommerce Academy, identifies CM as one of the three levers for building a scalable ecommerce growth machine. It helps you understand how a particular product contributes to the company’s profit. Mark has used CM alongside other metrics like conversion rate and repeat transactions to increase business profitability by 245%. For more insights and examples on how to use contributor margin to increase your profitability, you can refer to this article by Digital Commerce 360. 4. What are the limitations of your product? Seasonality – If your product has seasonal demand, then you will see an inconsistent flow of revenue. If that’s the case, you’ll need to document a strategy to tackle the lean season. Perishability – Suppose you sell homemade organic food. You need to quickly ship and keep your packaging temperature controlled, so you’ll need to figure out how to handle the storage and inventory for such quickly perishable products. A couple of other aspects you could ponder are your product’s durability and regulations that might limit the shipping of your product. Check the shipping restrictions of your potential providers. For example, here are the restricted items you can’t ship through USPS. 5. Can you visualize how you’ll scale selling the product? If you try scaling a broken business model, you won’t survive for long. For example, if sourcing the raw material for your product is challenging, then it will become a huge problem when the demand rises. You need to brainstorm how you will outsource your production. Similarly, think about how your future employees will handle various departments when you attempt to scale your business. To evaluate your particular challenges, refer to the detailed article by Core DNA on scaling an ecommerce business. While we can keep asking theoretical questions and playing with tools, sustainable businesses are only built when money changes hands. Here are two methods for validating your product ideas and saving your time as well as money. The quickest way to find out the demand for a product is by creating a product landing page that highlights its benefits. Then, drive targeted traffic to it through paid advertising. A budget of about $100 should suffice to begin with Facebook advertising. You don’t even need anything fancy. Here’s the landing page that Mint used to launch their business. If you get a decent number of sign-ups (which is subjective and you’ll need to make your own call on it), then it shows people are interested in your product. AppSumo also launched its time-limited digital products model by attempting to sell Imgur accounts. Noah Kagan used his email list, Reddit, and his network of friends for driving traffic to the Appsumo website. 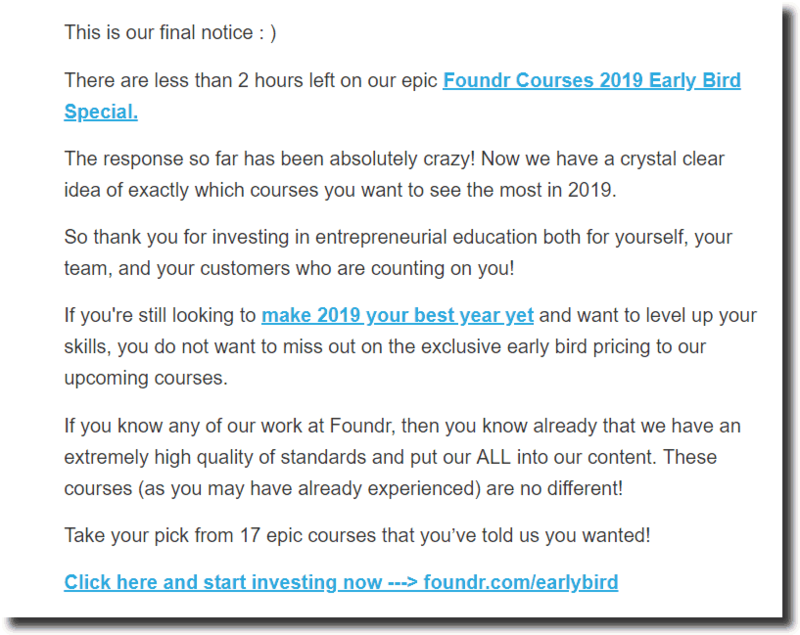 Do you know how Foundr validates all of its online courses? First, we survey our audience (that’s YOU!) and glean insights about your preferences and needs. Then, we build a simple landing page sending the following email with a shortlisted set of online course subjects. The email led to the following landing page. Pre-selling your product (at a discounted rate, if possible) validates demand and gives you confidence that people are willing to spend money on your product. Even if you don’t have a large audience, you still have an existing network. You could drop an email to 10 people talking about your product that you plan to sell with a link to your Paypal requesting payment. You can also try dropping text messages as they are more personal and receive responses immediately. What do you do if a few people pre-pay for your product, but you find that it doesn’t have sufficient demand? Simply refund the money and save yourself the time and effort. Do You Know What to Sell Online? Contemplating what to sell online can be confusing. But putting the time and effort to getting it right first can determine whether you succeed or fail. I showed you various strategies for ideation, then touched upon evaluating markets and validating of your product. Now, it’s your turn to follow the steps and settle on a product. Do you sell products online? And how did you choose the first product that you put up in your ecommerce store? Let me know in the comments below.